Identification: This is a chalk-white aeolid with prominent swellings on its rhinophores and, usually, an orange-red patch on top of its head. Often, there is also a narrow red line surrounding the bases of the rhinophores. It is similar to Bulbaeolidia paulae but is more coarsely mottled with fewer cerata in each arc and less well defined white tips on its cerata. Natural history: Bulbaeolidia alba is a common diurnal species found in protected to moderately exposed rocky habitats and in Halimeda kanaloana beds at depths of < 1 to 20 m (< 3 to 65 ft). When crawling, it jerks its posterior cerata rhythmically. 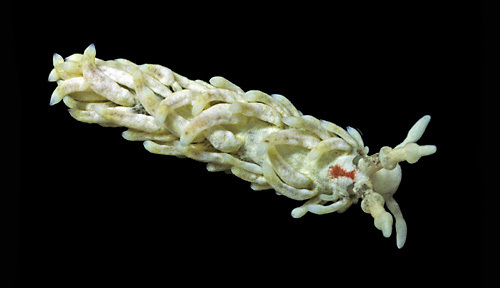 As least to a human eye, this makes it resemble a sprig of the calcified green algae Neomeris sp. waving in the current. Its egg mass is a weakly kinked white spiral. The eggs hatch in about four days in the laboratory. Distribution: Big Island, Maui, Oahu, Kauai, Niihau, French Frigate Shoals and Midway: widely distributed in the Indo-Pacific. Taxonomic notes: This species is listed on many sites as Aeolidiella alba. It was first recorded in Hawaii at Magic Island, Oahu by Scott Johnson on Jan. 18, 1978. Photo: PF: 8 mm: found by CP: Hekili Pt., Maui; Sept. 25, 1990.